The War of the Worlds was an episode of the American radio drama anthology series, Mercury Theatre on the Air, broadcasted on the October 30, 1938 and directed and narrated by Orson Welles. The radio broadcast was based on the novel by writer H. G. Wells from 1898. On the 6th of April 2003 Bas Welling (Dj Rioteer) gave his interpration of this radio drama on a local Dutch pirate radio. After the broadcast a small amount of tapes was produced and spread among a select group of people. Because of goverment anti-pirate radio regulations and the auctioning of the FM frequencies the pirate radio station stopped broadcasting on the FM, but the crew did a small reunion in September 2011 as part of the Incubate festival in Tilburg. 2012… the year that The War Of The Worlds recordings appear again. 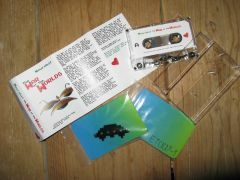 This time by Neurobit, an improvisation project by Bas Welling.The artwork is partly taken from the 2003 edition of the tape, but re-worked so it makes sense in the world as it is today.